Sarongs scream summer and are a resort wear essential! A trusty 'back up' for when you're racing out the door to get to the beach and don't have time to think 'what will I wear?'. 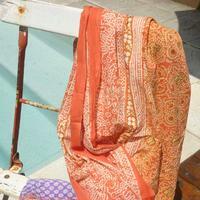 Our Sarongs are from Anokhi. Hand block printed in amazing colours and prints, each one a piece of wearable art. A larger sized sarong to wear so many ways. Keep one in your beach bag all summer long and you'll never be caught out. So very summer and just so easy!